I've been on a quest to find the best barbecue sauces, rubs, and marinades. One company that caught my eye was Holen One Farms. I gave their bbq sauce the big five stars. Everyone here thought it was a fabulous barbecue sauce. 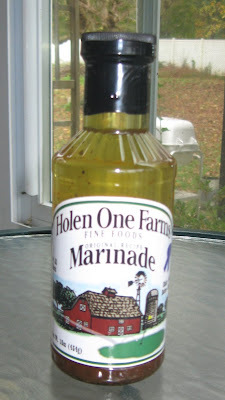 Holen One Farms marinade is good. It's a mild and very non-offensive marinade. It would work for most any meats and for most any guests. The flavor is good, and it does add moisture to the grilled meats. I do note that that Holen One marinade is a thin marinade with a high oil content, so especially if you grill over charcoal, you can expect some major flares as you can see here. If you get charcoal flares, then top off with the grill lid and shut down the vents to cut air flow. If it's an open hibachi style grill, then you have more issues. You can have a cup of water and sprinkle out the flares or pull the meat off if the grill starts to get too hot with major flames. I'd be more likely to recommend Holen One marinade for gas grillers where there's a drip guard and less chance for big flare ups with oil drips. Because, this is a thin and high oil marinade. You'll also get a less intense flavor than if you use a bottled marinade like Kraft Zesty Italian dressing (oil based - and not the creamy kind which will burn). That's a matter of taste, so for anyone who finds bottled Italian a bit overpowering, Holen One is layered nicely but let's the meat flavor shine. It does not add a lot of flavor but does add moisture and more subtle flavor experience. 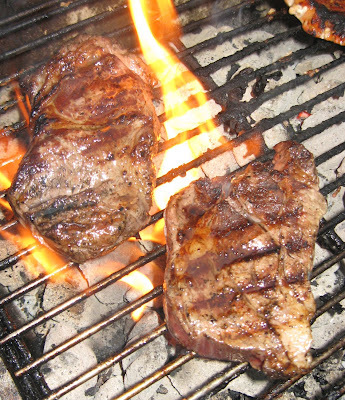 Don't use Holen One marinade over charcoal, unless you're experienced with temp control. On gas, you catch a break to some extent but may still need to adjust with the lid and temp controls. This is one hot burning marinade. On a side note, NO, I did not burn those rib eye steaks. I shot the photo fast and moved them away from the flare to finish them off. But, I've been grilling over charcoal for over 35 years. The Holen family got in touch with a really nice note thanking me for reviewing the marinade and the Holen One sauce glaze and for giving fair and balanced opinions. "When using the Holen One Farms Marinade with open flame grilling it is particularly important to follow the instructions as to the amount to be used. We recommend an ounce per pound to be added to the meat in a ziplock bag, which is then sealed and allowed to be taken into the meat for at least 4 hours and preferably over night. This will allow all the marinade to be taken into the meat and a minimum or flareups will occur. If there is still a significant amount of marinade surrounding the meat after the suggested rest time in the refrigerator, you are probably using too much marinade." Appreciate the extra info, and I need to round up my reading glasses (-: I tend to go heavy on the marinade. I'll try again and use a lighter touch when I pour. We did have a lot of marinade on our meat.